Be the first to share your favorite memory, photo or story of Wallace. This memorial page is dedicated for family, friends and future generations to celebrate the life of their loved one. Wallace Ray Garner, age 69, of Mt. 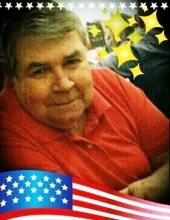 Vernon, Missouri, passed away at 6:37 p.m. on Tuesday, March 19, 2019, at the NHC Healthcare in Joplin, Missouri. He was born May 11, 1949, in Mt. Vernon, Missouri, the son of the late Henry and Marjorie (Hood) Garner. Wally was a 1967 graduate of Mt. Vernon High School, where he held several track records for many years. He was a United States Army Veteran, serving during the Vietnam Era where he earned three Purple Hearts and the Army Commendation Medal for heroism, presented personally to him by General Westmorland, Commander in Vietnam. During his deployment to Vietnam, he was exposed to Agent Orange which was being used to defoliant the jungle cover. He was a fabricator for Positronic Industries, worked at Schreiber Foods, loved to bowl and was a St. Louis Cardinal fan. Wally is survived by two daughters, Crystal Baker of Kansas City, Missouri and Crystal Phelps and her husband, Chuck of Mt. Vernon; three sons, Shane Garner and fiancé, Shannon Schnake and Travis Garner, all of Mt. Vernon and Wally Garner and his wife, Crystal of Tulsa, Oklahoma; caregiver, Gloria Garner of Mt. Vernon; ten grandchildren, Kearsha Garner, Whitney and Tyler Dean, Destiny and Desiree Alvarado, Alyssa Davis, Cassidy Baker, Marcus, Lucas and Kayla Price; two great-grandchildren, Aubree Garcia and Xavier Hoffele; one brother, Dale Garner and his wife, Mary, of Miller, Missouri; three sisters, Kay Robinson and her husband, Newt, of Stewartsville, Missouri, Vonda Pearlman of Tulsa, Oklahoma and Marsha Druce and her husband, Rodney, of Springfield, Missouri and several nieces and nephews. A visitation will be held from 6:00-8:00 p.m. on Friday, March 22, 2019, at the Fossett-Mosher Funeral Home in Mt. Vernon. Funeral services will be held at 1:00 p.m. on Saturday, March 23, 2019, in the funeral home chapel with burial to follow at the Summit Cemetery, northeast of Mt. Vernon. As per family request, please wear casual dress for the visitation and service. To plant a tree in memory of Wallace Ray Garner, please visit our Tribute Store. Summit Cemetery, Mt. Vernon, MO. "Email Address" would like to share the life celebration of Wallace Ray Garner. Click on the "link" to go to share a favorite memory or leave a condolence message for the family.